You have always had that desire to own an IPhone due to that striking look and the form factor that always has attracted but then rejected the idea of owning an IPhone due to the limitation imposed by the iOS. Well you don’t have to be worried about it anymore because china has announced Meizu MX that has the body and form factor of IPhone but runs on latest version of android. Now you must be thinking that it’s got to be a cheap imitation but you’re in for a surprise because it’s made out of highest quality of material that gives you the feeling of owning a premium device. When you’re looking at the phone you can’t deny that it has a strong resemblance to IPhone but its beveled edges give it away instantly. On closer look you will notice that the camera placement is different so from the back the phone doesn’t resemble the famous IPHONE. The front is taken up by 4.0inch screen with a resolution of 640×960 (same as IPHONE 4/4s) which is bigger than that of IPHONE protected by a gorilla glass and provides very sharp looking images and texts. The screen is as ASV LCD unit which provides unprecedented viewing angles than normal LCD unit. The central button is noticeably smaller than that of IPHONE but next to the home button there are two capacitive buttons which changes according to what the phone is doing. They also change their orientation with the phone and other settings are available which makes it a neat feature and sets it completely apart from the IPHONE. The android customization in MEIZU MX is so deep that you won’t ever recognize it. MEIZU call it the FLYME OS and the customization make it behave differently although there is the option of android market and you can also download various apps and install them. The android customizations makes you think that your using a completely different OS because there is lot of eye candy and entire user interface is very smooth and fluid. In the multimedia department Meizu has everything covered especially the music player which has the complete look of that of in iOS. The video player is able to run any and all form video formats even 1080p videos which are a joy to watch on the massive 4.0inch screen. 1080p videos run very smoothly all thanks to the DUAL CORE 1.4GHz processor that is ticking inside. 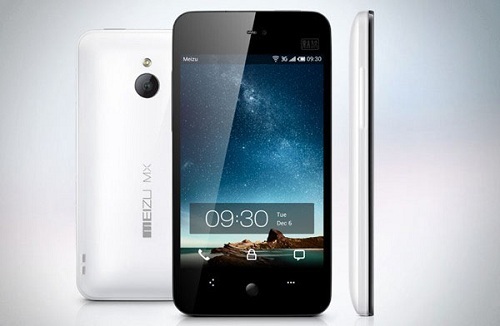 On the imaging side Meizu MX has it covered with its 8MP camera unit with a LED flash. The camera provides very decent quality pictures with plenty of details and good color renders. Well after all that it shows that the Chinese have produced a droid that will stand up to the competition which provides a unique android experience in the body of an IPHONE which differs from iOS as well. 4.0″ 16M-color ASV capacitive touchscreen with 640 x 960 pixels resolution protected by Gorilla glass. Full Flash support in the web browser allowing to run desktop versions of the website. 1600 mAH battery providing for your entertainment needs.